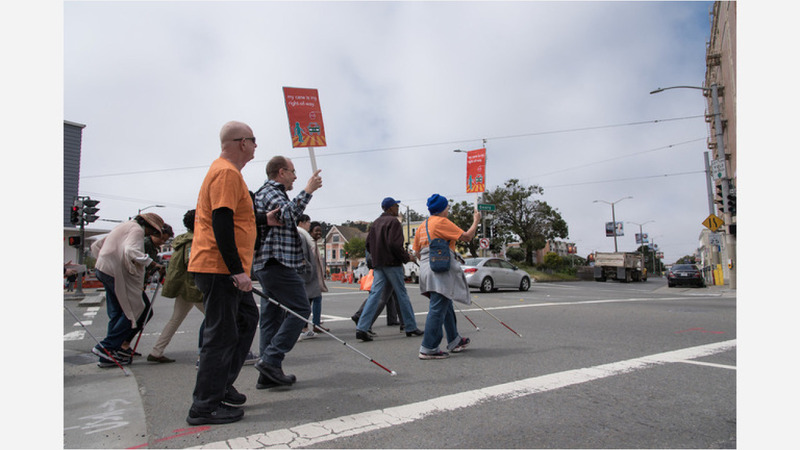 Today, nonprofit Senior and Disability Action (SDA) and the San Francisco Municipal Transportation Agency (SFMTA) announced a citywide increase in crossing times at signaled crosswalks. At an event at Geary Boulevard and Presidio, District 1 Supervisor Sandra Lee Fewer and representatives from the SFMTA joined community members and staff from SDA and Walk SF to commemorate the move. SDA began a campaign last year urging the transportation agency to increase the amount of time allotted for people crossing the city's intersections. 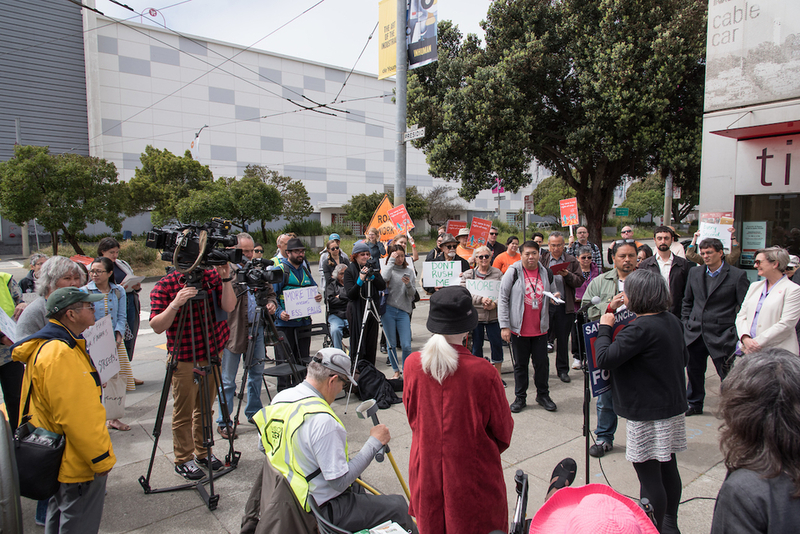 Advocates held press conferences in the Richmond, SoMa and Bayview neighborhoods to highlight the issue of needing more time to get across the street when given a green light. Supervisor Fewer speaks to advocates this morning. "It is terrifying and very dangerous to find yourself in the intersection when the light turns green, without the ability to run out of the way," said SDA member Sam Alicia Duke in a statement. SDA says that nearly half of all pedestrian deaths in San Francisco are seniors. "The fear of being hit by a car leads many seniors and disabled people to not go out in the community," which can result in isolation and early mortality, according to the group. Until today, the city's crossing lights only allowed pedestrians to traverse crosswalks at 4.5 feet per second. Noting that seniors or those with disabilities may need a little longer to cross, SFMTA has changed the allotted time to three feet per second. "I was thrilled by today's announcement of increased crossing times all across San Francisco, which demonstrates a commitment to our city's Vision Zero goals," said Fewer via email. "This is a much-needed change that will not only improve safety for seniors and people with disabilities, but also allow residents to have increased independence and mobility." The campaign to increase the amount of time allotted in the city's crosswalks "supports the goals of Vision Zero," an initiative implemented in 2014 to eliminate all traffic fatalities by 2024.